Just Jingle: Sending You Some Monday Morning Love - 100 Proof Press Style! Sending You Some Monday Morning Love - 100 Proof Press Style! Yup. It's Monday. And today, we are sending out BUCKETS of Love! YAY for buckets of love! Doesn't that just make you smile? I should. 'Cause buckets of love is totally a good thing. Just say'n. I created this card using Crate Paper's Portrait Collection. I pulled out the paper, the stickers, and the buttons! I love this collection! The tin pail is officially now one of my favorite stamps from 100 Proof Press! Seriously! I am totally in love with it!!! It's actually called the Shiny Metal Pail and is #1959-Q. 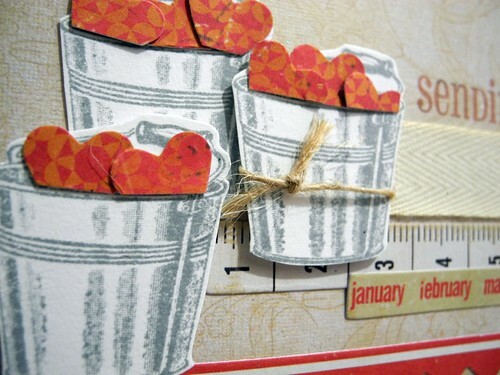 I stamped the pail three times and cut it out and then I filled it to the brim with punched hearts! I used foam dots to raise the hearts at different levels. WAY FUN!!! So....I'm pretty much just sending out BUCKETS of LOVE!!!! Once again, YAY for buckets of love!!!! Heee-hee! As for the time change, well, I was taught to save ALL the time, not just when it is convenient, so I think we should have stuck with our 'savings' plan, but hell, what do I know? HA! Always enjoy your blog posts, and have to say, I love your 'Dr. Who' inspired Shrine!!!! I knew it was Dr. Who the minute I saw it! Cheers to you! And have a great day!!! Post more pictures of your messy art room!!! That is a all-the-time card! LOVE IT! I mean, it's appropriate for ANY holiday or any 'ordinary' day! (ARE there any 'ordinary' days? Naaaaw!!!!) You are super-deluxe awesome! And I had seen your cool creations over at Retro Art Gallery & LOVED them - 'specially the Toy Shop! But I have a candy bone to pick with you. Shouldn't that big old 'jar' of candies be CANDY CORN? Bwahahaha ... sorry. Love you! Awesome card! Love everything about this. I love it. I wish I could get the crafty from my head to the paper the way you do. Fabulous piece, thank you for sharing! just love this, so beautiful! 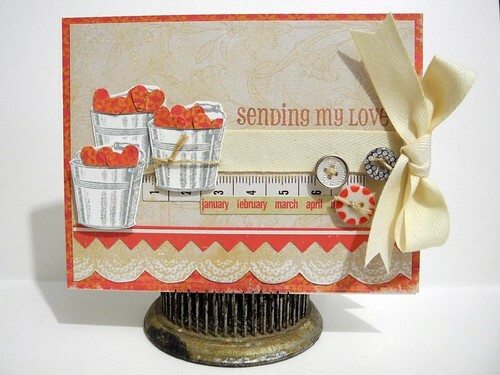 Great card - love the buckets and buttons! OMGOSH..this is beyond cute!! Love the buttons!! I love those fun buckets! What a great color scheme! Awesome card! Love the buckets filled with the hearts. ANd I'm kind of hating on time change right now - up before 4 am today, ugh. And here's a lot of LOVE back - wow your card is so SUPER SWEET!!! Love it! I am feeling the love man!! And you know that when you get the love back you get twice as much so I am sending it across the water!! Ace card! Gorgeous card! 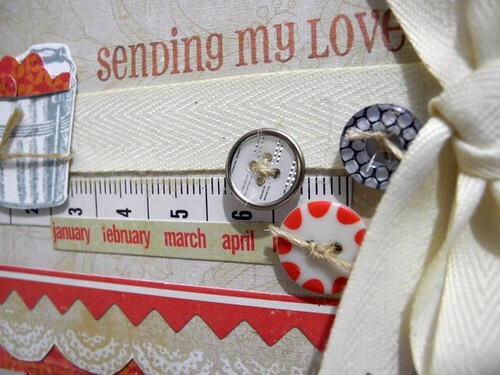 Love all the layers and stamping here.